After I owned this watch one year, I wrote an extensive review. There I described how I came to own this piece and my observations during that first year. This watch continues to be my everyday work watch--I wear it most weekdays. The interface of this watch could hardly be simpler. In fact, it is easy to believe that once you've glanced at this watch for a few moments, you've seen everything there is to see. You couldn't be more wrong. But during the first year I wore it more than 200 times, so surely I saw its entire repetiore of appearance tricks. No. Several more features of this watch have revealed themselves since I wrote my first review. I was driving to work one morning with my left hand on the wheel when the sun slanted in the window and reflected from my watch. Something that happens all the time. This time, however, the reflection happened to appear on the sun visor just above me. I saw the details of this reflection that I'd never noticed before. In fact, it never occurred to me to even look for these details. These pictures, taken when the rice paper was 5cm, 15cm and 25cm from the face of the watch, show how the flaws in the index placement make a glittering effect unique to this particular piece. Notice that because the indexes are not quite coplanar the index reflections don't change positions in lockstep as the paper is pulled away. One bar reflects out this direction, the bar next to it may reflect somewhere else. And because the bars are not perfectly flat (some are slightly concave or convex), some of the bars become concentrated dots or spread out smears. For example, note how one arm of the 'V' at the six stays short as the other grows--one arm is flat while the other is slightly convex. These glitter prints could be used to uniquely identify this watch in the future. The inner portion of the dial is very glossy, but if you look closely, the outer track where the hour markers reside is not quite as glossy. It turns out that the surface is cut with grooves which circle the track. These grooves are so close together that they act as diffraction grating. That means when a strong light hits this track, the light is spread into a color spectrum. In very strong light (my office is too dim), the outer track becomes a rainbow! My attempts to photograph this effect with my cheap camera were unsuccessful. Maybe you learned about cardioids in school but thought it was just some mathematical abstraction. Do they actually come up in real life? I can tell you they do. During the first year I owned this watch, it ran about +4 crown up and -3 dial up. I could therefore keep it regulated quite closely by alternating its overnight storage positions. The watch is slowing down linearly 6 seconds/day so is now actually running +3 dial up / +10 crown up ((2.5 * (+3)) + (4.5 * (+10)) = +52.5 seconds/week). The timing during storage is swamped by wrist wear and it simply runs +10 on the wrist. Some combination of these two situations (this seems likely). In any case I find it runs about a minute slow per week. About twice per month I set the watch (when it is a minute slow) to the current time plus one minute. During the next week it slows to the current time and during the second week it falls a minute slow, then I set it again. In late spring of 2004, I paid exactly zero dollars for this brown waterproof strap (shipping included!). An industry insider was looking for some inexpensive publicity by giving away this strap and I happened to be in the right place at the right time. I wore this strap for the entire summer and the waterproof finish held up very well to humidity and sweat. In fact, it will likely be my strap for next summer as well. The company that sold me this ostrich strap had three other colors available: black, brown and chestnut. And while pale colors are not generally used with rose gold, I chose tan as it was the color most different from any strap I already owned. The light color also toned down the white stitching which was used on all the offered colors. I bought a stainless steel double (butterfly) deployant with rose gold ends during the first year I owned this watch. Even though the body and lock release are steel, when closed the clasp looks like a beefy gold buckle. The 18k gold of the deployant takes abuse because of its vulnerable position on my arm. But the patina which is building up is lovely and gives a glimpse into the future of the entire case. I continue to use this excellent deployant with all my straps to prolong their lives and make dropping the watch less likely. I am pleased that all the straps I currently own continue to be in excellent shape. With tang buckles straps generally look well used with deep creases at the long end in only a few wearings. I was wearing my watch (as always) and I smacked my arm into something and whacked the watch good. I remember looking carefully at the watch immediately afterwards to inspect for damage. Sure enough, I had dinged the edge of the bezel which slightly overhangs the side of the case. Oh well. But I take it as a healthy sign that I have since forgotten what I banged it against. Once I accepted that such things are inevitable, it did not weigh heavily on my mind. And because it did not bother me that much, it disappeared from my memory. People who believe that steel watches will last just as long as gold ones might be reminded that alot of the energy of this impact was dissapated in deforming the soft gold of the bezel so less was transferred to the movement inside the case. Strong steel would deform less but impact the movement more. For example, racing cars are designed for the "case" to be destroyed by impacts thus better protecting the contents. During the time I've owned this watch, we got a new yellow lab puppy whom we named Honey. If you know anything about lab puppies, you know they have lots of energy and like to chew. One evening, while wearing my watch, I reached out to pat Honey's head. Excited by the attention and perhaps thinking I had some food, she twisted around quite violently and tried to mouth my wrist. I heard a click as my watch case smacked against one of her teeth. Careful inspection revealed a new flatspot on the face of the bezel between 11 and 12. Was I mad? Look at that face. How could I be mad? There's a small nick along the sharp corner between the top face and the left side of the 10:00 lug. I have no idea how this happened. Because I wear the watch on my left arm, it may be that this occured when I wasn't wearing it. The bezel is not level with the crystal, but sticks up a little higher with the crystal recessed slightly. Anything striking the crystal and sliding off will encounter the bezel on the way. The scratch on the face of the bezel at the edge of the crystal at 8:00 is quite minor, and subsequent minor polishing (I run a Blancpain polishing cloth over the entire case every week or so) has mostly removed this. I have no idea when this occurred. The entire case has begun to show a slight patina where the gold softly glows in the light rather than throwing harsh sharp reflections. This is due of course to a thousand tiny scratches. The patina is not even, after only 2 years of building it there are some nearly mint surfaces as well as more aged sections. By far, the patina is most advanced at the 9:00 side of the case where the watch contacts the box when placed lazily crown up for the night. It is encouraging that the patina here (which shows the future of the entire watch's finish) is very attractive and I expect it to improve further as it ages. Part of what makes this watch so striking is its wide expanse of dial (about 36mm diameter) looks as if you could touch it because the crystal is nearly invisible. This makes the dial 'pop' in a very vivid way. To accomplish this, the watch has an antireflective coating on both the inner and outer surfaces of the crystal. However, the antireflective coating is much softer than the sapphire itself. While it is nearly impossible to scratch the sapphire, the coating can be scratched. The scratches that have built up on this coating in 2 years cannot be seen in normal room light. A strong light must hit the crystal at a glancing angle to see the few thin lines that are present. Eventually the coating will detract from rather than enhance the visibility of the dial, but at the current rate of decline, it will be several decades before that is a problem. At that point, the coating can be removed (polished off). In the meantime, I'll enjoy the clarity of the piece. This continues to be my only 'good' watch. I have little desire to seek a replacement as this watch continues to work well as an everyday watch. And even after two years of close daily examination I still believe this is the world's most beautiful watch. Such a high standard is hard to match so I have little incentive to grow my collection. In February 2004, I wrote about Year One with my Blancpain Villeret. I want my watch to last 500 years. In order for my watch to last longer than me, I want to imbue all subsequent owners with some of my passion for its longevity. So I've been writing a narrative of its history so far, a discussion of the requirements to keep the watch in service, a justification for acceptable and unacceptable modifications, a maintenance schedule. There's even a guide for watchmakers with as much technical detail as possible (with pictures) even including such details such as a specification for caseback markings (since there may be over 100 marks eventually). And of course there's space to add owner information, service/repair history for the next few centuries. Assuming that excellent provenance will lead to longer life, I'd like to make sure this document stays with the watch. I'm considering taking the warrantee manual (the thin one) and replacing it with this new booklet (the watch is grey market so the papers are unstamped anyway). Perhaps I can even take the book apart so I can reuse the cover stock (with watch embossed) so it looks real sharp. The problem is the manuals don't actually reside in the inner box, they're in the outer box which is more likely to disappear over the centuries. In 498 years, we'll know if it worked. Most people believe the soul is the part that endures. So for a watch to have "soul" it must last and last. A mechanical watch can be fixed no matter what breaks. A quartz watch is unrepairable if certain parts break. It cannot have a soul since it cannot endure. I was wondering if someone could tell me what the face and hands on the watches are made off. In some older watches I notice the face has and is fading. Will this happen to Blancpain watches or are they using any "new" materials that do not age the way the older watches did? The dial is brass (as are all watches) which is painted or enamelled. All the hands and markers are 18K gold, matching the case material. Even a steel watch has 18K white gold hands and markers. The luminous material is Luminova. The 'life' in a fine watch. First, if you are asking for innovation, you must remember that you are treading in areas with deep traditions. And these traditions live on for one very good reason: they've worked. The dial is brass as it has been on watches for centuries. This material has many advantages and has proven itself under real-world conditions. There are many materials used now for watch dials: 24k gold, carbon fibre, meteorite, mother of pearl, plastic. But brass is either just plain better or reaches a better price point--after all, a ruined dial can be easily refinished or replaced if its value does not exceed that of the movement. If you are looking for the perfect material, let me assure you it doesn't exist. But enameled brass must be considered fairly close. Carbon fibre may be closer, but remember that if you want the movement to live on, the dial must be able to be remachined in the future. Easy with simple tools in brass, with carbon fibre it takes more significant infrastructure and who knows what the future will bring. Maybe it will be easier, but if the past is any indication, it's more likely nothing will be 'fixed' and infrastructure to accomplish this may be hard to come by. Gold is used in indices and hands traditionally for lifespan (which is why replacing hands during routine service is the wrong approach). Plus, have you looked at the hands? I mean really looked? Believe me, gold is the right choice. Will a Blancpain age? Yes, yes it will. Will it age better than most? Yes, because high quality finishing always means longer, but not infinite, life. But remember it is the movement that all the other parts serve. As long as they can perform their duties so the time can be read, a little aging does not destroy the function of the watch. Are there watches that will last longer? Probably, but in all the likely candidates for extreme age, it is not the case and outer elements which will be the deciding factor. It is what's inside that counts. And its housing better not be worth so much that it lives, and subsequently dies, by the fate of that housing. What is your "ultimate" watch? Generally speaking, most of us start our watch collection from a relatively simple basic model and upgrade to a more complicated and costly piece. We gradually accumulated knowledge based on experiences and perhaps mistakes we have made. For those who do not buy watches purely for investment purpose, I wonder what is your "ultimate" watch in your collection when one day you know you can afford the price of that piece. Perhaps most people get more complicated watches as they learn more. For me, it was quite the opposite. When I was younger I loved digital watches and the more functions they had, the better. But as I got older, complexity for complexity's sake held less and less fascination. I began to see the careful and judicious use of functions usually accompanied a cleaner and clearer interface. Eventually, I was exposed to enough wrong-headed interfaces to change my thinking. I now wanted consistently applied rules with no jarring missteps. I began to see in watches many examples where the parts 'fought' with each other and often for no good reason except the designer hadn't thought it through. For example, why are there so many fonts on dials? I've seen one font for the hour markers and another on a subdial. Why?!? Then there's times when a subdial is eaten here but overlaps there. Or there're numbers at 4 and 8 on one subdial and at 3, 6 and 9 on another. Or there's a different color hand but it doesn't match the color of the track used to read it. All these inconsistencies grate on me. So when I had learned enough to want a 'good' watch, I knew it would have to be completely consistent. 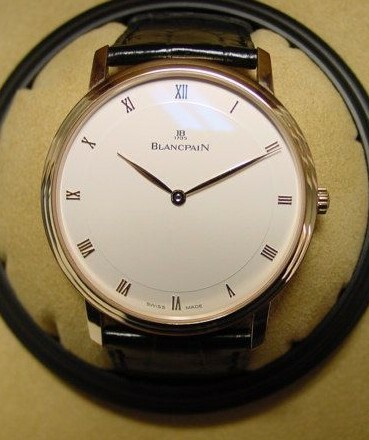 Once you eliminate the watches with some design mistake (yes, I said mistake), you are left with my Blancpain. I've often thought the same thing but I would add the date. Can I ask your reason why no date? It doesn't make the dial much busier and adds a function I use a ton. I actually have a Flyback and have never used the chrono portion for any reason other than to see if it works. What would you do? Put the date in applied gold roman numerals? No. Obviously it would have to be arabic and painted. So, to continue with my need for consistency, therefore the hour markers must be painted and arabic. OK, it's easy to find such a piece. But consider the problems of arabic if no jarring elements are to be found. Can they be painted radially as the romans are on my watch? No, that puts the number '9' at the bottom (6 upsidedown). OK, just put 9-3 radially bottoms toward the center and 4-8 radially bottoms toward the edge. But then there's those sudden swaps from 3 to 4 and 8 to 9 that bug me. The only solution is hour markers upright all the way around. Well, that means you can't tell where the minute hand is pointing (since the center could be anywhere in the digit) so additional elements are necessary on the dial to make up for this design flaw--either dots/bars or a full track. And of course on my watch the hands and markers from which you read them are the same material. That means my hands can't be that beautiful gold, they must be also painted the color of the markers. And yet I love the play of the light off the gold elements of my watch. All in all a very high price in aesthetics for the added function of a date. Besides, the date is projected onto my blackboard in the lab where I teach so doesn't need to be on my wrist. Everything an amateur does to a dial makes it worse. Here's an example: My Blancpain came with a scratch on the dial from the factory! (The case has never been opened.) But I just live with it because there is really nothing I can do about it. It is small and generally not visible with the naked eye (except in just the right light). Now I guess I could try to make a stink with the guys in Switzerland, but in a few more years when I crack this puppy open for its first service, I'll be much more relaxed pulling the hands. After the first ding in a fancy new car, parking is much less stressful. After all the scratch is a slip from a professional watchmaker working for a top-tier atelier, so my own slips will be in good company. Besides, no gem is flawless. It is the flaws that make a piece unique.